Necessity is the mother of invention (something Plato said). What this means is...if you really need something, you will find a way to do it. Well, Courtney "really" needed matching curtains in her dorm room. The problem is it's a flat metal window on a flat cement block wall. 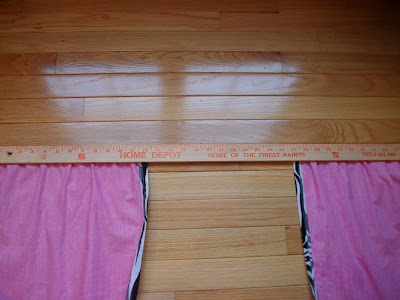 No way to hang a curtain rod or even use a tension rod. Hmmm, what do we have left after spending 8 gazillion dollars on school tuition and all the matching "necessities" for her room? How about a 68 cent yard stick from Home Depot and the bed skirt from the bed in a bag that matches her zebra comforter. We didn't use the bed skirt, so I cut the decorative part off the white fabric that goes under the mattress. I cut 2 long pieces and one shorter piece. Here is a picture of the yard stick, which is easy to cut to the size you need, because it's already a ruler...just cut on the lines!! 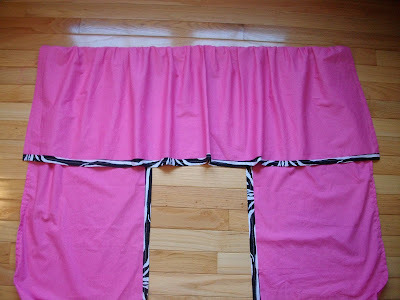 I hemmed the sides that I ripped of the white part and then staple gunned them to the yard stick. I spaced it out with a little gather and again used the marking on the ruler to make it even. 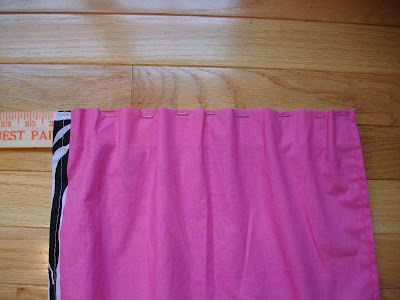 Here's a close up of the left...if you were doing this for yourself, you could use wider fabric for more gathers...I just used the width of the bed skirt fabric. This is the piece I had remaining for the valence. 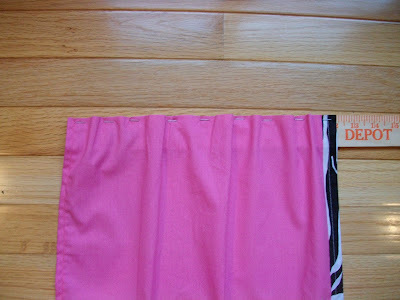 I sewed 2 lines of a gathering stitch across the top and gathered it up to fit the yard stick. 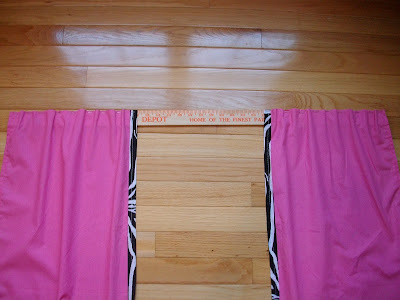 I centered it over the 2 side panels, folded over about 1 inch to the back and stapled it in place on the yard stick. This is the final product and all I needed to do was put a little sticky Velcro on the back of the yard stick and stick it to the cement block wall above the window. This is a picture of the back side. The last picture of it installed on her window should have been here, but I forgot to take a picture. So I called her a few days later and told her to take a picture and email it to me. "Oh, mom, I forgot to tell you...we not allowed to have anything on our windows. I had to take it down". WHAT!!! my 68 cent window treatment not allowed. Didn't they see that the trim matched the zebra comforter and the pink pillow sham? Here's the moral to this story...I'm so thankful I only spent 68 cents, because now it's rolled up and shoved under her bed some where. spaceI did get a Tool Time out of this though, because I'm thinking of other places we could use this application, not just a dorm. How about in an apartment where you can't nail in the walls. 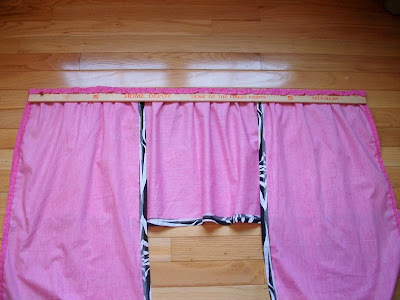 What if you wanted little curtains on a garage window or door. This would also work great on the little windows in the sheds people have in their back yards. If you have a metal door and want a little privacy, you could use heavy duty magnets instead of Velcro to attach the curtain to the door. I'll keep thinking and don't forget to share your ideas in the comments too, because I know you are all thinking outside the box now!!! ps...I'm catching up on all my replies, so don't think I forgot you. It's just that the I Spy fabric for the swap is starting to come in and there is a lot of organizing involved. I'm off on Wednesday, so I'll try to catch up then. spaceI Spy Swappers... I know I owe you a list of all the swapper names, but I have to do it Wednesday. My sister was working on our computer all day Sunday and Monday to prevent it from crashing. We had hardly any memory left and it was super slow. I think it's fine now thanks to her, but I'm behind in the post that I owe you. 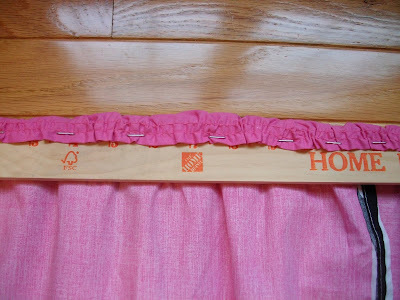 What a creative way to use a bedskirt. Too bad she could not use it on her window! I was so excited about your ingenious creation and anticipating that final picture and then it was crushed!!! Oh, if it were me I'd have a fit! 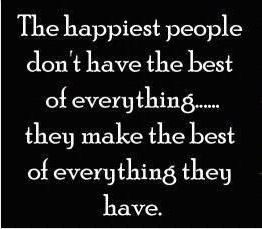 I hate spending time and energy on something just to have it wasted ~ but, like you said, it has sparked thoughts about where you could use it! You are so clever and I love reading your tool time posts! Oh That is just adorable! It's a shame they didn't let her keep the curtains! I hope she has blinds at least! 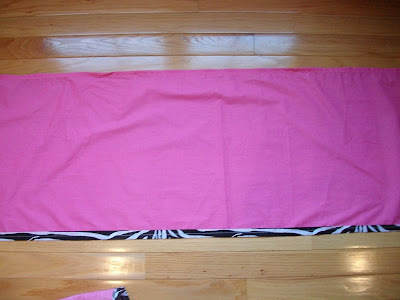 I just love the zebra print and it so cute with the pink! Never had to think about putting up curtains on a cement wall. Great idea!! I will have to remember that in 2 years.